The Federalist published an article by Lillian Quinones that is about the experience of a Belgian palliative care nurse. Sadly, this is not a new story but a continuing story. In 2014, I republished an article by Claire-Marie Le Huu-Etchecopar a French nurse who worked in Brussels for 6 years, and who witnessed many euthanasia deaths. The article - Lifting the veil on euthanasia in Belgium uncovers multiple stories of the abuse of care related to euthanasia. In 2015 Paul Russell wrote the article Belgium: Euthanasia and Palliative Care, strange bedfellows referring to the political work of Jan Bernheim to implement euthanasia, in Belgium, as part of palliative care. The article by Lillian Quinones interviews Sophie Druenne, a Belgian palliative care nurse. The article begins with Sophie telling the story of a euthanasia death that didn't "work out." Upon administering a lethal dose, the doctor left the room. But the patient was not dying. Recounting the story to her friends and family outside the hospital, Sophie realized the horror of this situation and began to question Belgium’s so-called social experiment with euthanasia. Historically, palliative care was defined by the anti-euthanasia beliefs of its founder, Cicely Saunders, a British nurse who developed a holistic method of caring for the dying in the 1940s. Witnessing the rise of effective pain management strategies and drugs during her lifetime, she believed that a patient’s request for euthanasia represented a failure to adequately care for the patient’s spiritual, emotional, and social needs. Nonetheless, Belgium attempts to reconcile Saunders’ standard with their euthanasia laws, which made history again by granting death to three minors last year. Sophie tells the story of her first experience with the "new ethos" of palliative care. Sophie remembers first remarking on this shift in ethos when attending to a patient with strong breathing difficulties. At the time, she was working with another nurse, and they called the attending physician in for help. Hearing their suggestions, the physician decreased his initial prescription of morphine. The patient died a few hours later, probably as a consequence of her disease. The fact that the practitioner changed his mind so easily indicated to Sophie that his initial prescription wasn’t medically justified. This experience emboldened her to question decisions of practitioners and appeal to the consciences of her colleagues in ethically challenging cases. Sophie explains how her experience continued in the Oncology unit that she worked at. As she continued to work in this particular oncology unit, Sophie noticed that the ethical shades of grey were disturbing the medical team as they reacted to the unilateral decisions of the physician to prescribe euthanasia. They expressed their disapproval by pronouncing the phrase “We’re helping people,” in a sarcastic tone, Sophie said. A Belgian study found that more than 1000 people died by euthanasia without consent in Belgium in 2013. Sophie explains that she left Belgium to find a place that was equipped to handle pain without euthanasia. It was not the euthanasia cases per se, however, that moved Sophie to uproot from Belgium and leave behind family and friends. She left in search of an institution where practitioners and medical teams were better equipped to treat suffering. Effective treatment of suffering excludes euthanasia—the “easy solution”—and defies the vision of integrated palliative care. Sophie believes that this vision fails because of the contradictory premises of palliative care and euthanasia. The replacement of “first, do no harm” with “first, relieve suffering” reveals IPC as a dominating framework instead of an authentic integration. When physicians are given unilateral power to void “first, do no harm” under certain conditions, altruism can lead to involuntary killing. Likewise, the guiding principle of “first, relieve suffering” does not bar death itself as a solution. 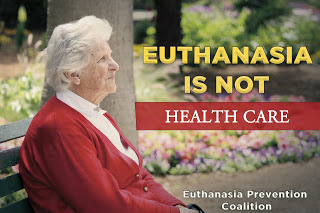 The advent of IPC tells the latest lesson from Belgium: the normalization of euthanasia installs a new guiding principle for physicians and effectively nullifies the “autonomy at all costs” argument of proponents, by the sheer number of involuntary euthanasia cases. Sophie now works in Paris at a hospital where terminally ill patients are treated with traditional palliative care. She says her experience with cancer treatment in Belgium revealed to her the limits of medicine’s power over suffering, especially mental and existential. Sometimes there are no medical solutions, but palliative care offers holistic answers to evaluating the patient’s needs beyond the physical. Speaking as an insider to Europe’s pro-euthanasia fever, Sophie beseeches medical professionals to defend their maxim of “first, do no harm,” lest medical care conflate itself with murder. In Canada, the Québec Health Minister, has pressured palliative care doctors to participate in euthanasia. A recent Delaware assisted suicide bill defined assisted suicide as part of palliative care. When palliative care includes killing, it changes palliative care and we all lose the care that we need as we approach death. Lillian Quinones is a first-year medical student at the Medical College of Wisconsin, Green Bay. She graduated from Hillsdale College with degrees in biochemistry and journalism.